Vancouver is certainly not the only city facing problems of scarce, expensive housing. Nor is it the only city responding to those problems by building laneway or infill houses. In Portland, Oregon, these homes are called ADUs — Accessory Dwelling Units. 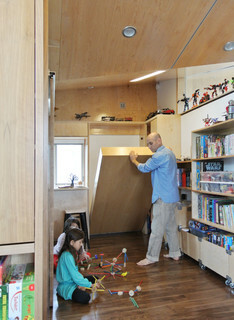 Unlike the laneway homes we know and love in Vancouver, they also include basement suites in this category. And unlike the process here in Vancouver for laneway homes when you build an ADU in Portland they waive the permit fees. That’s right — the city waives the permit fees for new infill buildings. According to this story in the Tribune, in Portland that can save you between $8,000 and $11,000. That development permit waiver started as a pilot project in 2010, and was continued in 2013. In Vancouver a similar program would mean savings of around $20,000 per laneway house. 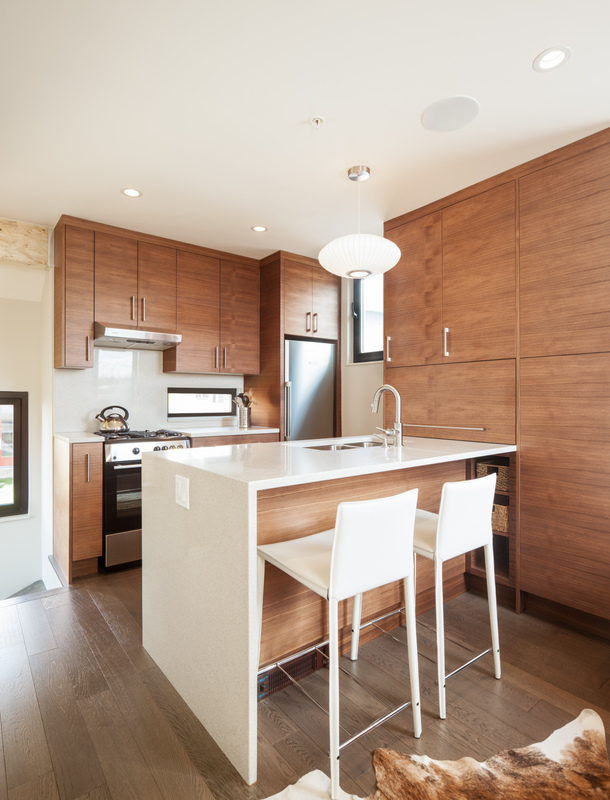 “Smaller homes have significant environmental benefits compared to other green building strategies. Building small is a very green thing to do,” says Palmeri. Regardless of their size, ADUs are generally more environmentally friendly than a new home built in a traditional subdivision. They require no new land, less building materials and energy usage. They help Portland and the metro area meet population growth needs without developing farm land. Putting those residents in existing neighborhoods reduces sprawl and vehicle miles traveled, easing road congestion. the mean cost for an ADU is nearly $78,000, with about a quarter costing more than $120,000. “That’s a lot of money for a lot of people,” says Palmeri. In our neighbourhood numbers like that would have us drooling. It would take a lot of number-crunching and cost-counting to bring in a laneway house for $120,000. 81 percent of ADUs in all three cities are used as primary residences, only 18 percent of occupants are family members and 53 percent of occupants were strangers when they moved in. And the majority of owners in all three cities — slightly more than 50 percent — built them for the additional rental income. Lean, green, income generating machines. 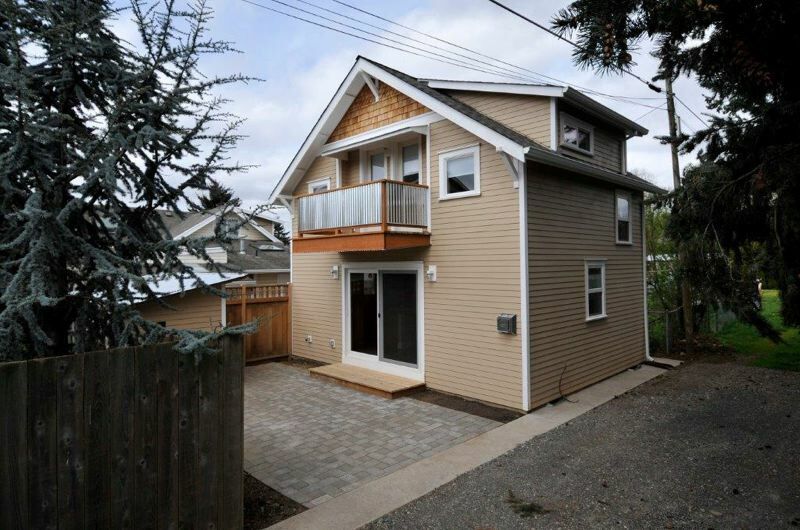 It’s great to see how laneway houses can improve cities — and lives. Posted in Cities, Housing, Laneway House, Small House and tagged Laneway House, Neighbourhoods. Bookmark the permalink. I get around most of the time by transit — I don’t like to drive (and DH does not like me to drive his vintage auto) and I don’t like to ride a bicycle. In the rain. Uphill. And I’m not ready for a motorized wheelchair, although my Dad loved tearing around the streets of Nelson on his Rascal. I work too far away to ride a bike to my job, and if I want to go shopping there is a strict limit on how much I could carry home. But what if there were another way of getting around? It’s a trike, so it’s more stable than a bike. It can hold a lot of cargo (up to 350 lbs, according to Life Edited). It’s got an electric motor so you don’t have to pedal all the time. It’s solar powered. And it’s so darned cute! 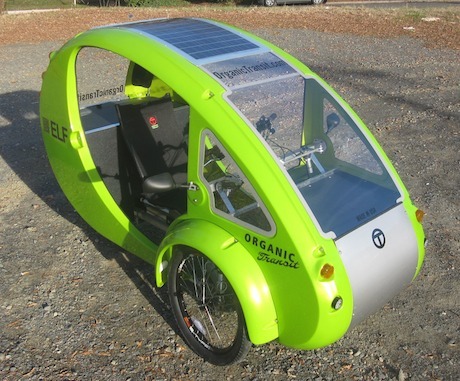 Check out the website for Organic Transit — the people who make this adorable little transport. It’s a great idea, maybe a game-changer for traffic-congested cities. I don’t see me driving down the main byways of Vancouver in one of these — and riding a bike or a trike on the sidewalk is not allowed. But if they can knock down the price from five grand American, if they can get a few communities to adopt them, I think we have a fighting chance to replace cars for zipping around the immediate neighbourhood. 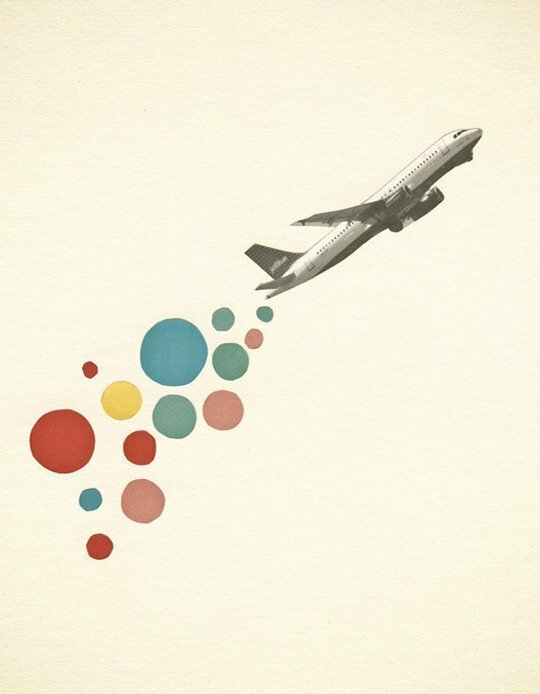 After all, if half of all car trips in the US are three miles or less, this could revolutionize how we get around. With our aging population (and rainy weather), bikes are not always feasible. The ELF could be the answer. But isn’t that what I said about the SEGWAY? Posted in Cities, Housing, Minimalism and tagged Laneway House, Vancouver. Bookmark the permalink. 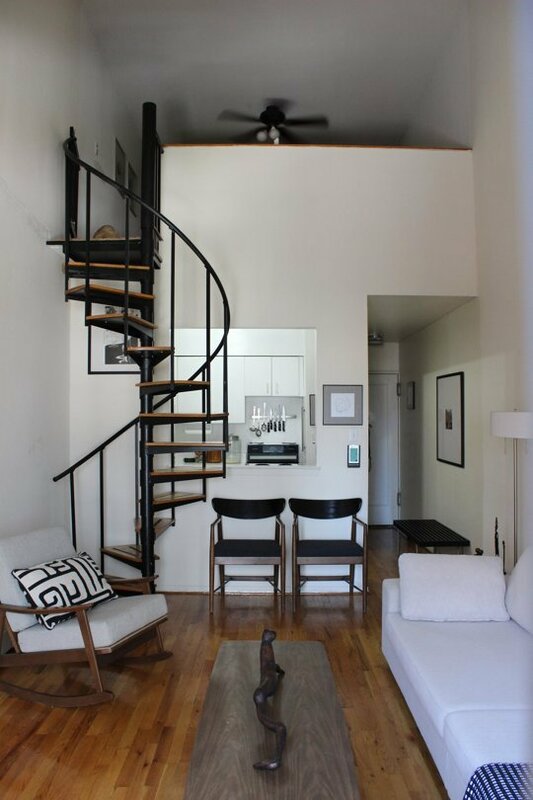 Apartment Therapy is a great source for info on small spaces. Let’s face it — most apartments are small. That means getting clever with organization and use of space. 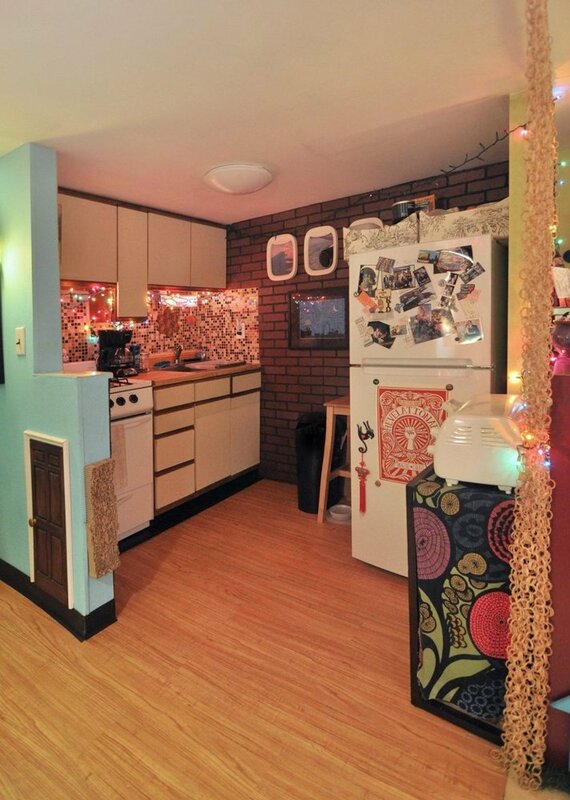 With my mind on kitchens, I was looking through some tiny apartments in Apartment Therapy to see what people have done with these spaces. 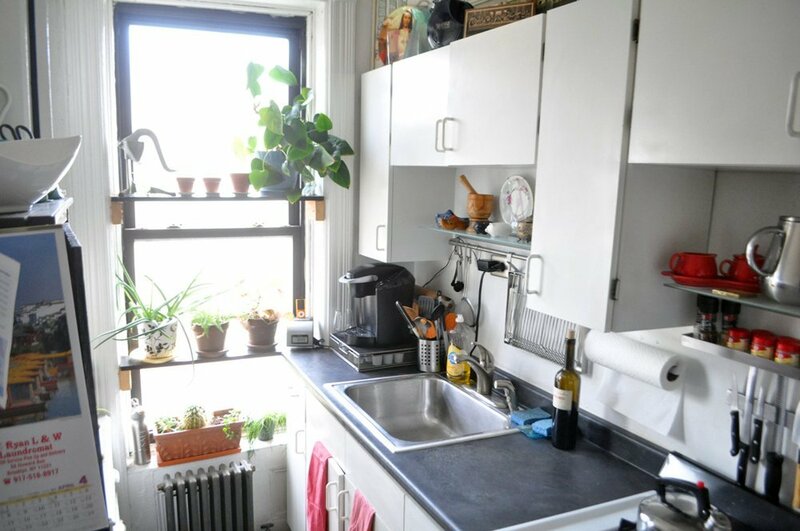 Apartment kitchens are usually pretty dull for two reasons — a) they are tiny, and b) they are full of things that are expensive to install and replace — appliances, cupboards, floors. 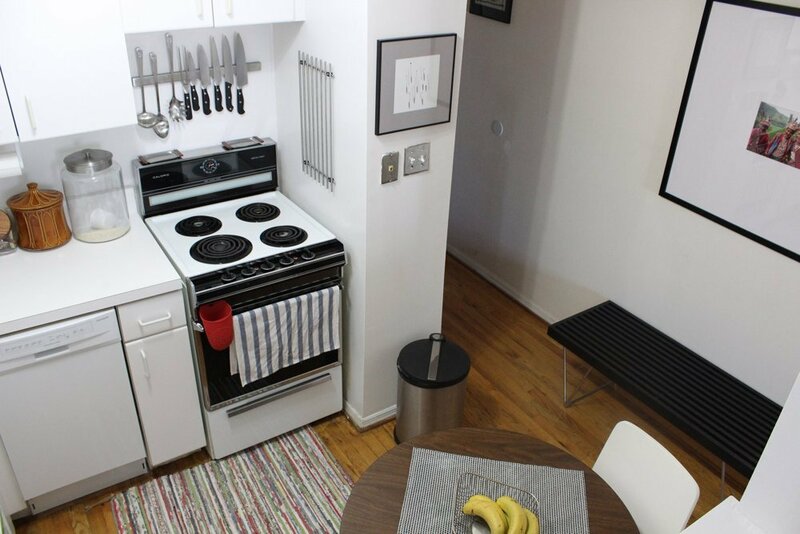 So most apartment kitchens start off fairly…..pedestrian. Those white/almond cupboards with the wood trim? Fairly ubiquitous. 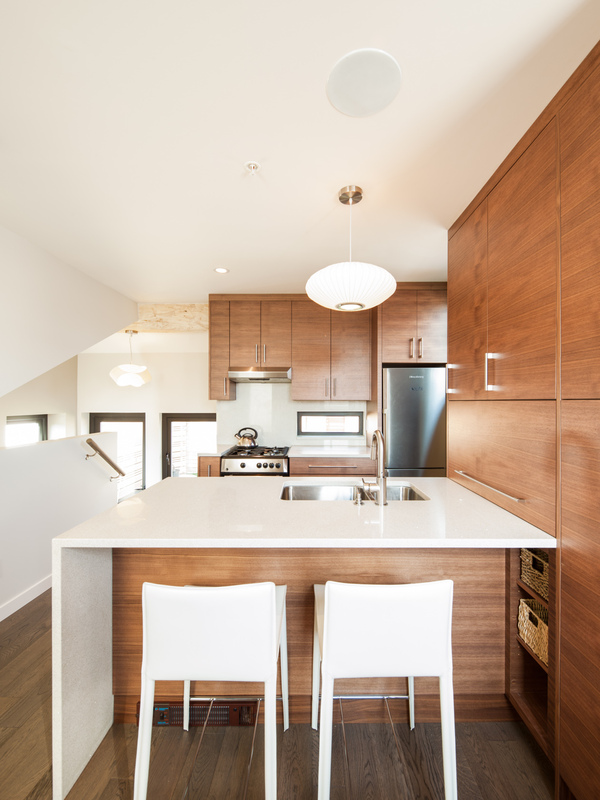 This owner has kept the accessories white to add to the feeling of cohesion and spaciousness. 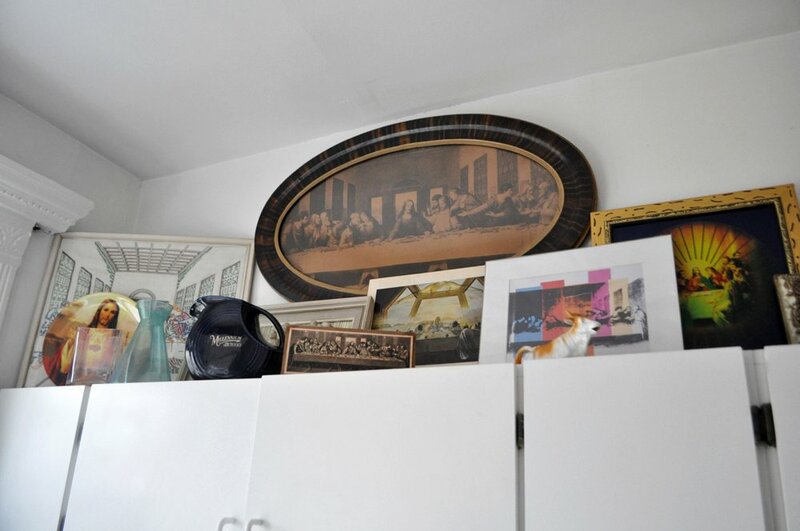 It’s tidy and pleasant, and the upper cupboards go right to the ceiling rather than have that dust-collecting shelf at the top. But there are obviously strict limitations. In this suite, they’ve put the kitchen in the space under the sleeping loft, which means it’s basically the foyer as well. The owner has colour-coordinated the accessories, which is nice, but it’s clearly meant to be as unobtrusive as possible. I think that’s a better use of space than putting your extra casseroles up there. Sometimes plain is a good thing. These renters have played off the white of their kitchen by keeping to silver and black — continuing the sleek modernism of the rest of their loft. When we were planning our laneway, we wanted a nice kitchen. You have to compromise, but the kitchen was not the place we wanted to do that. Instead we sacrificed a “living room” for a more spacious cooking and eating area. Photo courtesy of Novell Design Build. You can see how light and bright it is. And there really is tons of storage. A pull-out spice shelf, appliance garage, plus deep drawers for our dishes and pots. This is what it means to have a custom kitchen built just for us. 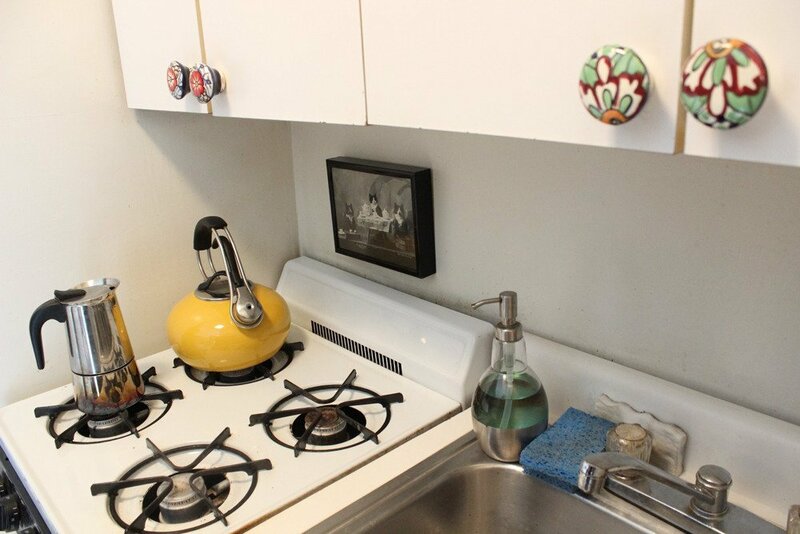 I’m sure you will look at that kitchen and think “I would have done things differently.” Well you can! We wanted this, and we got it, thanks to good work from our designer, our builder, and our custom cabinet maker. We change up the accessories to add more personality to the space. And we keep it very, very tidy. The kitchen is the heart of the home, and we wanted one that would inspire us every day. Posted in Housing, Laneway House, Small House and tagged Kitchens., Laneway House, Small Style. Bookmark the permalink. It’s Alive! Living beneath a living roof. One of the most unique features of our home is something we’ve come to take for granted — the living roof. It was grown for us out at N.A.T.S .Nurseries in Langley, who are representatives of LiveRoof. It’s very green and ecologically responsible and etc. etc. of us to put in the living roof, but we originally just wanted it because it looks nice. Because our roof is visible (due to the slope of the property) the folks in the main house and the neighbours are looking at it whenever they look at the laneway house. And because we have flat roof not just on the upper storey but also on the top of the garage and some of the lower storey, we just wanted something nice for them to look at. The roof of the garage is right outside our kitchen window, and it’s much more pleasant to look at a garden than a heli-pad black slab. 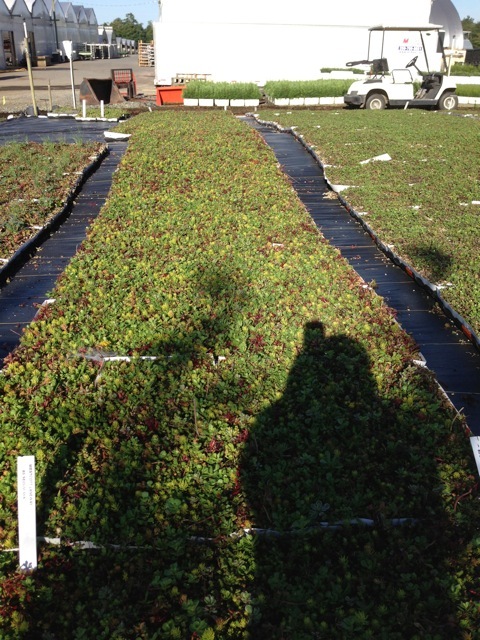 Our roof is an extensive green roof, a carpet of sedums and other low-growing plants. An extensive green roof would support larger plants, even trees. But it turns out there are lots of other very good reasons to install a living roof of either kind. According to the Green Roofs for Healthy Cities site, living roofs offer benefits to more people than the home owners. 1. Cleaner water. Living roofs clean storm water. Here in Vancouver we can have real downpours. The water runs off hard surfaces like roads, sidewalks, and yes, roofs, and enters the storm sewer system. All at once. That can overwhelm the system. But living roofs absorb and retain the water, delaying its entry into the storm sewer and easing the pressure on the system. Plus the roofs filter the water, and through evaporation, lessen the of water they deliver to the system. The living roofs keep cooler during the day due to the evaporation that goes on, but they also cool off much faster than hard, black roofs once the sun is down. 3. Cleaner air. Plants clean the air of pollution and particulates. So living roofs can reduce smog. 1. Energy efficiency. The living roof acts as an insulator during the winter, keeping the home warmer. Plus in the summer, it keeps the home cooler because the plants provide an insulating layer PLUS the evaporation of water through the plants lowers the temperature. You may have set a sprinkler on your roof during the super hot weather to cool it off — that works by evaporation and our roof does that all the time naturally. 2. Fire retardation. If a building near by catches fire and the sparks land on our roof, they will just go out. It would be like trying to light a lawn on fire. 4. Increased durability. The plants protect the membrane below them from the destructive rays of the sun. A living roof can last at least two times longer than a plain membrane roof. And that keeps membrane and sealant out of the landfills. There’s some maintenance to be done on the roof — weeding! We’ll also be putting on a little fertilizer. Thanks to N.A.T.S. Nursery for their help. Posted in Cities, Laneway House and tagged Laneway House, living roof, Small Style. Bookmark the permalink. When I am not strumming on my old banjo (which is totally not something I do) I like to cook. And I like to eat. So a well-designed and -equipped kitchen was tops on the list of what DH and I wanted in the laneway home. 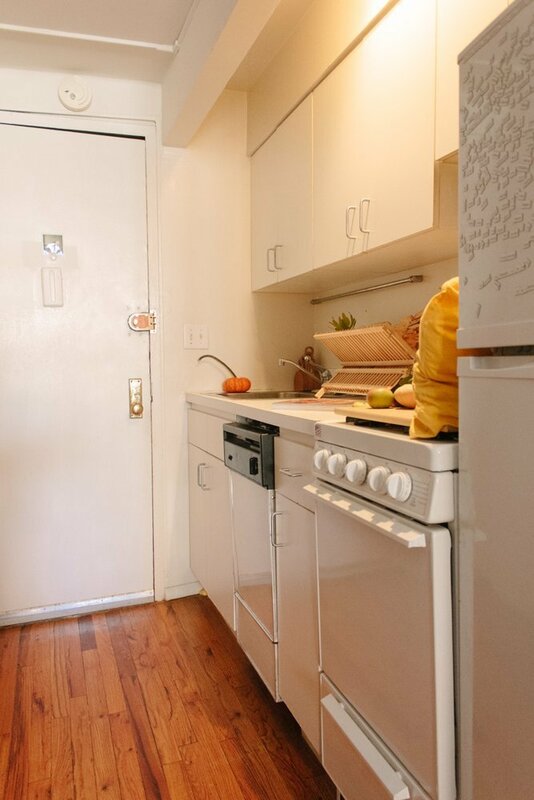 Some laneways have tiny galley kitchens, but we wanted one with all the bells and whistles. 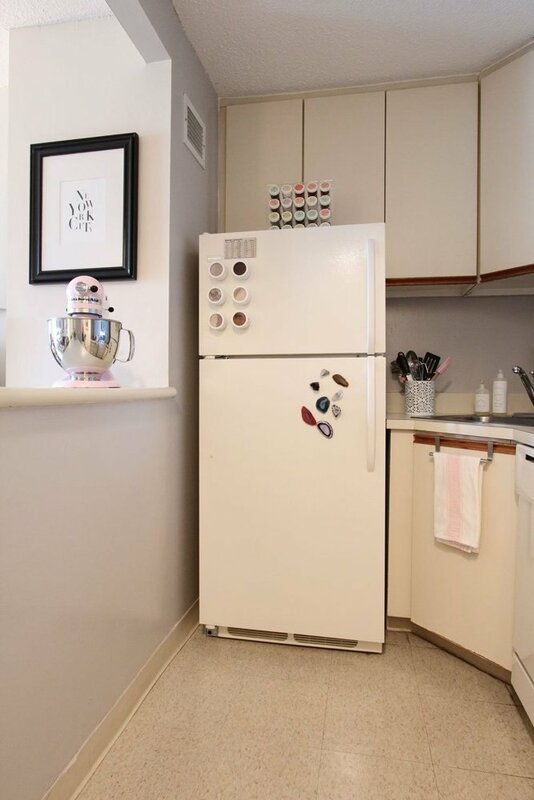 The appliances are small but they are efficient and the design has made us more efficient. 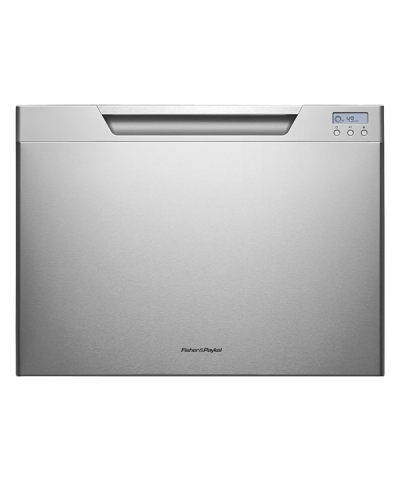 It was while I was unloading our adorable little drawer dishwasher by Fisher and Paykel that I realized it wasn’t just its size and efficiency I loved — it was also its location. When it came to the under-counter storage I knew I wanted drawers for storing my dishes and cooking utensils rather than cupboards. Drawers give you access to the complete space, pulled out into the light. No more rooting around in dark corners — everything is right there. And when I am unloading the dishwasher, having the dish storage just beside it makes putting everything away a dream. Or at least less of a nightmare. It also helps that the dishwasher is placed just under the counter, so there’s less bending and stooping. It takes a few minutes to unload the dishwasher and then it’s ready to hold the next meal’s worth of plates, etc. There are never any dishes sitting on the counter waiting to be cleaned or put away. And it’s changed our lives! Because here’s the funny part — in our old home we hardly ever used the dishwasher. DH hates to have dirty dishes sitting all day waiting for the machine to be filled up so it can be run (he can hear the germs multiplying) so he washed them up after every meal (note: I did not wash them, he did.) But then we had dishes sitting in the rack on our counter all day. The smaller size of our new dishwasher means we do smaller loads more frequently — perfect for the life we lead. For some reason unloading the dishwasher is a dreaded chore in our house. It’s a pain to dread something that needs to be done daily. When I dread something that needs to be done daily, it’s a red flag. It’s an opportunity to evaluate if I’m helping or hurting the situation just by something simple that I can change. So she reorganized her kitchen so the dish storage was next to the dishwasher and voila! The chore that everyone was dreading a lot became just another small thing to be done. Dishwasher unloading takes about 90 seconds and even the 16-year-old thanked me for planning out the kitchen to make unloading the dishwasher super fast and non-dread-inducing. Do read the whole post at her blog. And when designing a space — whether it’s your kitchen or your bath or your foyer — remember to design around how you want it to work, not just how you want it to look. Posted in Decorating, Laneway House, Small House, Uncategorized and tagged Laneway House, Small House, Small Style. Bookmark the permalink. Two people can live as cheaply, and in as little space, as one. One bedroom for two people just makes sense for us. 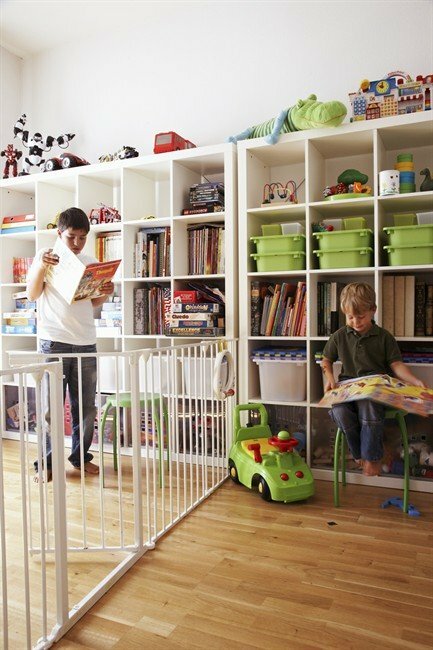 Families, however, need private space for their children — and space is at a premium whether you live in a condo or a small house. 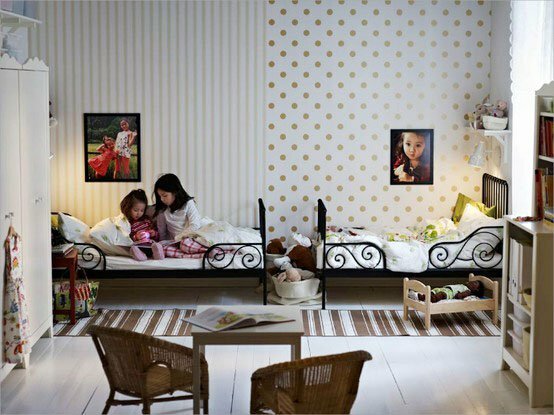 When I was a child, lo these many years ago now, my sister and I shared a room for many years with bunk beds. Eventually we had our own rooms, small spaces but completely our own with our own closets, dressers, desks and beds. 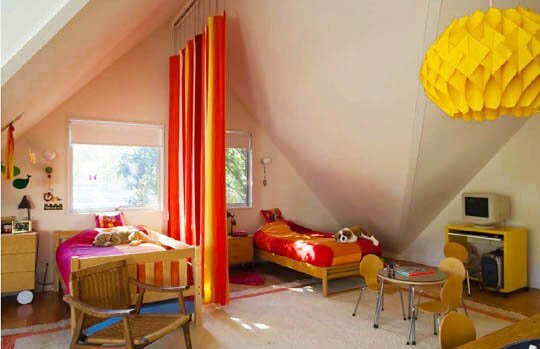 But putting two children into one room is possible — and many people are doing it with style. Some people like to give the children identical spaces. This room is for two sisters. 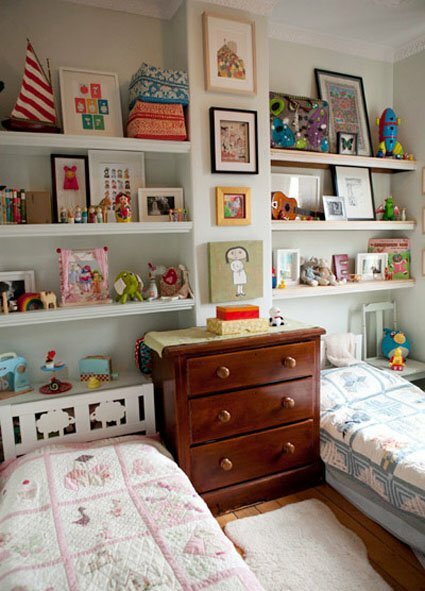 In another space (below) shelves hold the personal belongings of each child, even though the spaces look identical. Good use of vertical spaces. And you can even put up a physical barrier in the room to split it. If the kids get along well, a curtain will be fine. This is a good idea if one person is a neatnik and the other not so much. The little boy’s bed is hinged at the side, like a Murphy bed; the little girl’s is hinged along the side, like a Pullman bed. Fitting more people into less space is kind of a mission with me. 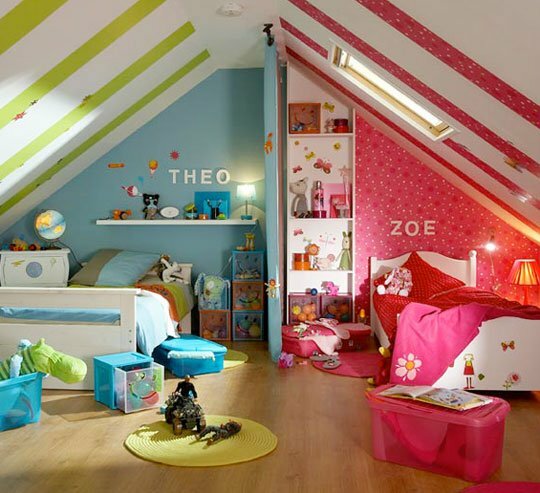 I’m glad to see these stylish and comfortable options for families living in small homes. Posted in Decorating, Housing, Laneway House and tagged Laneway House, Small Style. Bookmark the permalink. Well, despite what good old nurturing Mother Nature is doing to various parts of the country, here in Vancouver it is definitely spring. Last weekend I did my spring planting. And I also checked out out shrubs to make sure there were little buds on their bare limbs ready to turn into leaves. But what about inside? What’s springing up there to make us think the season has finally changed? 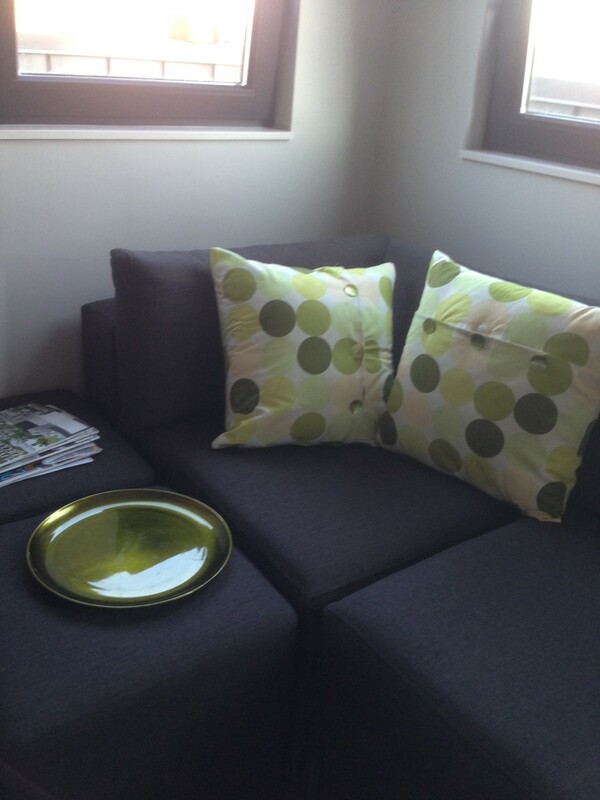 Cushion covers for our sofa — nice green with dots. Plus a little round tray for setting your coffee upon (ottoman doubles as a coffee table). To finish the look, a bowl with the same green for fresh fruit and matching linens. 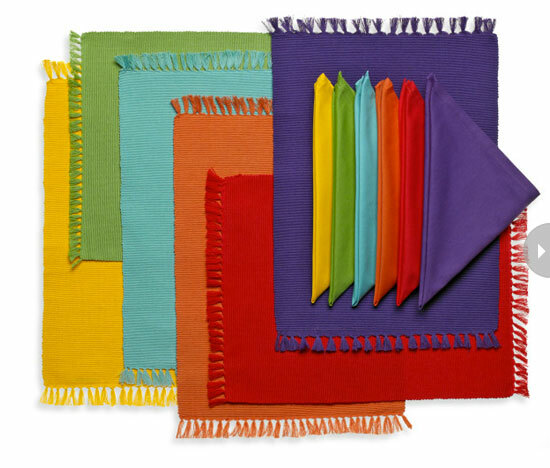 What other ideas can we provide for freshening your decor? Well, you can start small with placemats and napkins. Here’s a set from Style at Home’s website. Those would brighten your table — and look great with your winter-white china. 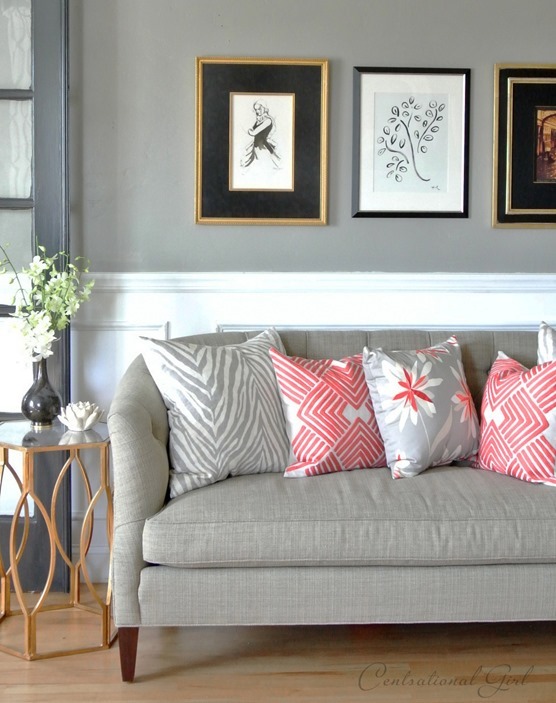 To change out a whole room in one go you could paint an accent wall or follow SAH’s advice and apply a wall decal. 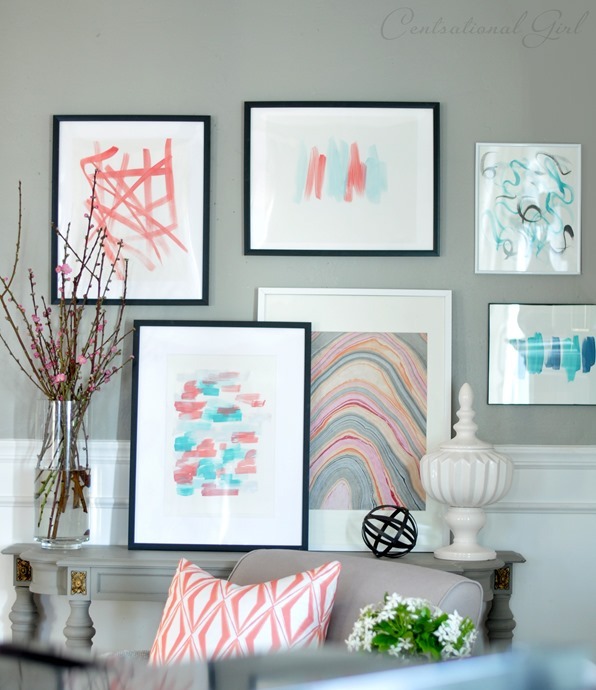 Centsational Girl added some coral cushions to the cool grey of her front room, then created some artwork to match! She painted that simple botanical above the seat, and some colour-matched abstracts to pull the colour into other areas of the room. 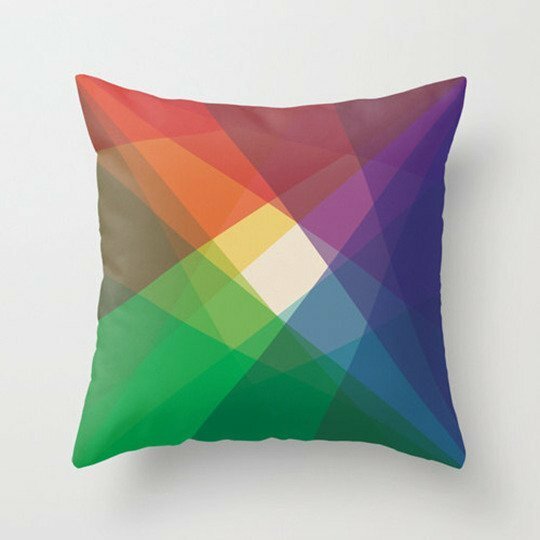 Apartment Therapy reminds us that rain also means rainbows. In accessories. If you’ve been living with winter for a while be sure to start your re-newal with a good spring cleaning, open the windows, bring in some greenery and celebrate. Posted in Decorating, Laneway House and tagged Decor, Laneway House, Small Style. Bookmark the permalink.